If you've ever built a Technic set, you know what a potentially dizzying complexity they can reach. And if you've ever tried to build your own Technic creation, you know just how deep the rabbit hole goes. The possibilities of connections, complex mechanical structures and intricate linkages is effectively limitless, and can quickly become overwhelming. Well, luckily there's a new resource to navigate those murky waters, The Unofficial LEGO Technic Builder's Guide, Second Edition. 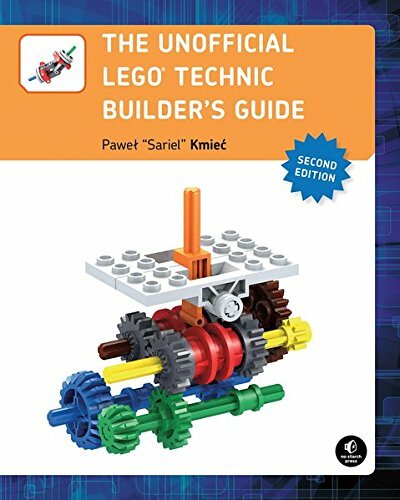 If you build Technic, you need this book. The first impression of this book is "utilitarian", and I don't state that as a negative. It's got a no-nonsese cover, in matte finish, with a complex transmission assembly. This looks like an information depository, not right reading or some kind of ode to the art of mechanics. It's a reference guide, through and through. The next thing you'll notice is the weight and thickness. At over 400 pages in length, it's truly a wealth of information. It's square bound, making it a bit resistant to sit flat while open, at least at the beginning and end of the book. Inside you will find a jaw dropping amount of information. Everything from gear ratios to tire sizes and motors to pneumatics. The book is very logically and cleanly organized for as much information it has and how much the Technic system tends to sprawl in complexity. Just ask anyone who's even tried to organize a medium sized Technic collection, it's very difficult. There are so many part with so many connective properties that it quickly becomes unmanageable. This book avoids that by sticking to the business at hand of the given section. Now if you're expecting to open this book, grab your bins and bang out a snowmobile or F1, you're going to be disappointed, It's not that kind of book. There are no step-by-step models to be found. And personally, I applaud that because it would just add unnecessary bulk to an already big book. What you will find are structures you can adapt to the model you have in mind. Like steering and suspension for cars or a pneumatic pump. And the point is not just to give you a shortcut to these assemblies, but to give you an understanding of the principals behind them. You will find some inspiration from time to time, like completed models from builders around the world. But just enough to illustrate how the concepts in the book translate to real world building. Mostly you'll find a fairly macro focus on the principal of the chapter, sometimes to a surprising degree, like the subtle differences of 8 tooth pinion gears through the years. The gear reference alone in this book is worth the price, it's really that good. Overall, I'm beyond impressed with this book. It's an absolutely indispensable wealth of mechanical information broken down into manageable and delicious bite-sized bits. It takes the staggeringly complex Technic system and makes it approachable and inviting. I give it 5 out of 5 Nerdlys.